Whether as a hobby, a way to upgrade your home, or in a more professional capacity, wood is a malleable material that is ideal for construction projects. 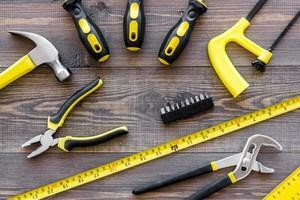 For completing large scale projects, you typically need more power tools. But what if you want to do woodworking projects without power tools? In this article, we will look at which tools you will need to do this, and the types of projects you could expect to complete. Power tools can save a tremendous amount of time and provide a much higher level of control over the work you are doing, but they aren’t suitable for everyone. The obvious barrier to use is the price. For projects at home, you won’t necessarily want to buy lots of expensive power tools. It simply isn’t practical. You may also find yourself needing to work in areas with no power supply or simply prefer woodworking with hand tools only. Working without power tools is possible, but you may find yourself needing extra time and patience to complete the job. If you aren’t using any power tools, there are a range of hand tools may want to consider to ensure you can do whatever job you require. If you are new to woodworking, it is important that you don’t bite off more than you can chew. You should choose something that is easily manageable, so you’ll be able to finish it and be so proud that you will move on to something new. Choose a small, manageable project that is still challenging. Bedside tables or coffee tables would be a great place to start. Work with a single joint. Doing so keeps the complication to a minimum and allows you to practice and perfect that particular joint. A bedside table, as an example, requires eight mortise and tenons, which you will be cut correctly by the time you are finished. Using too many different types of joints means you will have to learn a lot in one go and never actually perfect any of them. Materials are critical. Rather than working with a cheap pine wood, for example, you’ll be much better off with a decent hardwood (such as a maple or oak) that will be resilient, look great, and not punish you too much if you make a slight mistake. Don’t stain or dye. With your first project it would be a good idea to avoid stains and dyes, and just choose the type of wood that looks the way you want your final project to be. It’s very easy to accidentally ruin a project at the end when you stain it, so it’s only worth doing once you are more confident about the whole process. Here is a selection of projects that are ideal for making by hand, and ones that are feasible even if you are new to working with wood. A Side Table – Whatever you use them for, there’s always space and need for a side table in the house. They are also relatively simple to put together as you will only need to make a board top, four legs, and pieces to connect them. There’s plenty of ways to tailor the design to make it unique, and the only joinery you will need is eight mortise and tenons. By making a side table, you’ll learn all the basics you need for future, more complicated, projects. A Bookshelf – Bookshelves are also multi functional around the home. Like side tables, it will teach you all of the basics you need while being simple enough to complete. To keep things under control, your first should have no more than four shelves in it, and there are many different ways you can construct one- giving you the chance to experiment with new types of joints and woods. They are also ideal to let your artistic tendency’s run wild, and you can alter it to look however you want. The use of Power Tools has become the norm, but there’s something to be said for building a project by hand. Woodworking projects without power tools can take a lot more time and effort and requires you to develop skills you wouldn’t otherwise. The result will, however, be much more personalized and may give you something to be proud of. It’s simple to get going, all you need to do is make sure you have some basic hand tools, some decent wood, and a manageable project to start with. But before that, don’t forget your safety precautions before you start a project.